Ocean view from the Casbah. Thomas and I arrived in Rabat on Saturday, after a slightly tearful goodbye with Lala Fatima and Zakia. After a much needed long, hot shower, I went to see the newly opened Mohammed 6 Museum of Modern Art with my friends Esther, Noa and Alice. While I enjoyed the current exhibit, Medieval Maroc, I favored the permanent collection, which left me very sated in terms of art appreciation. This museum has gathered an impressive array of work by Moroccan artists spanning the early 20th Century through today. The works from the Mid-Century Modern period in particular were quite fabulous. On Sunday we (finally!) had the much ballyhooed Language Proficiency Interview. I am pleased to report that I met the High Novice level that volunteers are expected to achieve by this point-yay me! I can’t really describe in words my sense of well-being and lightness on Sunday after the LPI. I rather felt like dancing through the halls of the hotel like Mick Jagger in the Start Me Up video. Although I restrained myself from actual dancing, I danced in my head for sure. Chicken strut and all. 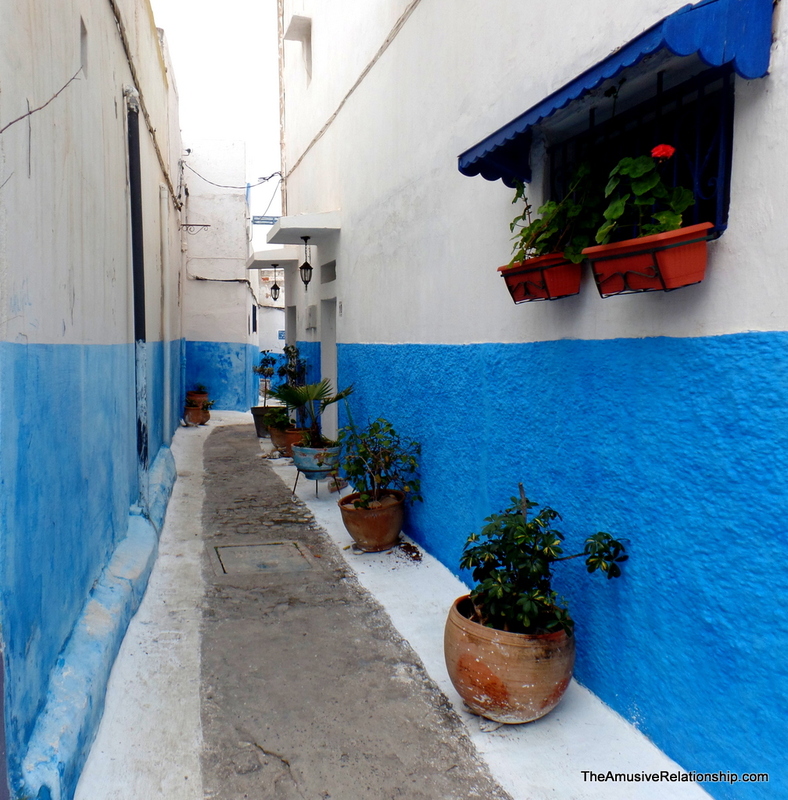 Wandering through the Casbah–oh, those blue walls are so zwin! After the LPI Thomas and I, along with several other married folks who we have come to call friends (shout out to Lloyd and Esther, Steven and Jenny, and Malicki and Elaine! ), walked to the Rabat Casbah and old medina. We had a great time wandering around this part of the city, and I especially liked seeing all the cats that lounged about the Casbah gardens. To end the day we went for dinner at Tian An Men Chinois Restaurant where I enjoyed some Szechuan string beans and eggplant in brown sauce. Today our Staj elected committee members for various Peace Corps committees, and I am quite pleased to share that I was elected to the Volunteer Action Council (VAC)! This committee meets twice a year with Peace Corps Morocco staff to address a variety of concerns that volunteers bring forward. From what I learned, VAC committee members are meant to be a first-line resource for volunteers to problem solve issues that they encounter living and working in Morocco. VAC members also provide some measure of emotional support when a volunteer is struggling with their service. I feel quite honored to be part of this committee, and hope to be a good resource for my fellow volunteers. 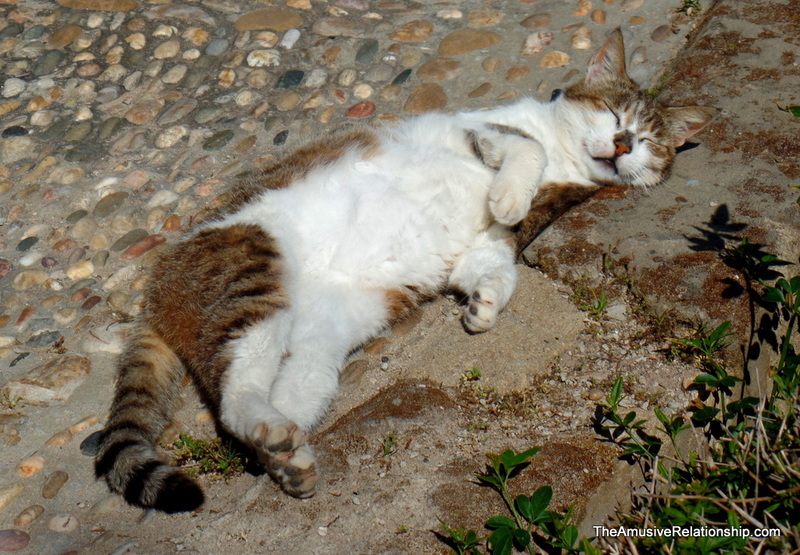 This casbah cat looks almost as relaxed and happy as I did after my LPI. Almost. As we approach Wednesday’s ‘swearing in’ ceremony, I look back on my time in Morocco so far and feel shocked by all that I have already experienced! How has it only been 11 weeks? At this moment it seems like a much shorter time than that. Dare I use the old cliché? Oh, why not! Time flies when you are having fun. And now off to the lands of sand and sun! On that note, may you all be well, wherever you are!